All you Brick and Sizzle fans rejoice! 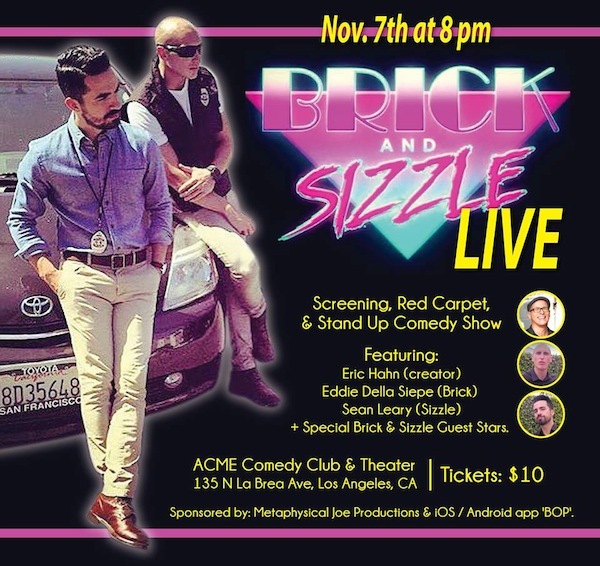 Metaphysical Joe Productions and social platform BOP will be presenting Brick and Sizzle LIVE at the Acme Comedy Theater in Hollywood Saturday, November 7th. What can you expect? A live stand comedy showcase hosted by Darren Capozzi featuring your favorite maladroit LAPD officers who moonlight as models PLUS a red carpet, screening, and meet and greet with the stars, Eddie Della Siepe and Sean Leary. You’ll also see creator Eric Hahn and producer Geoff Plitt there! Woo hoo! Don’t miss out on this great event! Mentions: Red carpet 7:30pm. Curtain 8:30pm. After party 10pm. Get Brick & Sizzle LIVE tix HERE. Click on ACME Hollywood link. 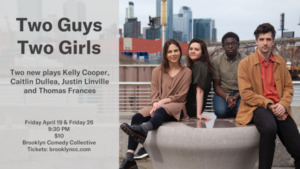 $15 tix at the door. The Acme Comedy Hollywood Theater is located at 135 N La Brea Ave, Hollywood.